Create a cheery statement in your garden with this pair of aged-effect purple planters. Perfect for bulbs, bedding, shrubs, houseplants and more, this stunning pair of chalk-effect purple planters will add an exquisite decorative look to your home or garden, without the cost of real metal pots. Hand finished in purple paint, using a brand-new technique developed last year, they will add a touch of class to your home or garden. A far cheaper alternative to expensive ceramic or metal pots, they're lightweight and easy to transport around the garden while still providing a tough and durable support for plants. Finished off with a stylish, aged finish, they will certainly help to provide spectacular garden displays for years to come! Brilliant value, we supply 2 x 30cm (12in) Plastic Planters. 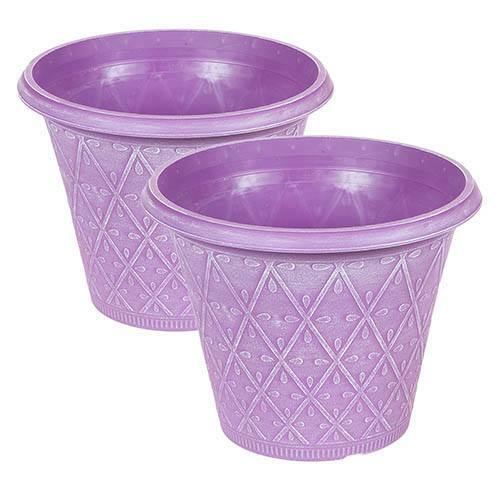 Brilliant value, we supply 2 x 30cm (12in) purple plastic planters.